I know the feeling of having your nose clogged horribly and having it disrupt the productivity of your day because it makes you feel awful. At times, I just want to put a stick of dynamite up my nose because it’s that bad. Fortunately, Fluticasone Propionate or the popular brand of it called Flonase is available over-the-counter for purchase online or in-store whenever you want some without a prescription from a doctor. So what’s the difference in this new generic spray and where’s the cheapest place to get it? I enjoy this corticosteroid nasal spray myself and I use it whenever my allergy symptoms are too much to handle during the spring, summer, and fall allergy seasons. I remember when Flonase was made available for the public over-the-counter without a prescription and I was very excited because the price would be lower and I could just go to the store or order it online. Personally, I prefer Fluticasone over many other allergy sprays and OTC antihistamines because it is fairly gentle and has less potential to be addictive. Therefore, I have already searched the internet to try and find the best price for a reasonable amount of this nasal spray. I’m not the type of person that prefers to buy things in bulk to save money because I would feel guilty spending $100 dollars on a chemical drug because I’d feel kinda gross knowing that it’s all going into my body in the future. When I need a new pack or two, I always check for the best sale value online because you can find it very cheap on some sites. Recently though, I’ve found a really good value for online over-the-counter Fluticasone Propionate on Amazon that beats everything else that I’ve come across. That includes brand Flonase, which is above twice the price but the same effectiveness overall. 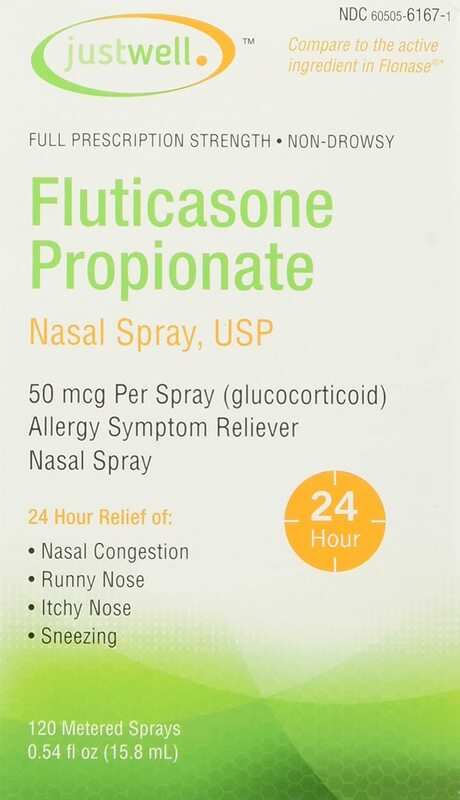 This seems to be a common question, but there is no difference between the prescription Fluticasone Propionate allergy nasal spray and the over-the-counter version available without a prescription from a doctor. Both of these medicines contain the same active ingredients. You can buy both to test the different effects and you will find out that they are exactly the same. It’s a common misconception that the prescription OTC medicine is tweaked to be available for purchase at the store. Perhaps many believe that some allergy drug company found a loophole around the active ingredient to make it legal to sell in stores. However, the reason that these new allergy medicines and OTC antihistamines appear in our local drug stores each year is that administrations like the FDA had determined that it should be safe and legal to purchase in the store with minimal risks for abuse. When a medicine or supplement is available for simple purchase at the store without a prescription from a doctor, the public is worried about their children purchasing it or stealing it from the store. Benadryl doesn’t create much of a pleasurable feeling, unlike fluticasone propionate which doesn’t affect your perception at all, but some kids want to have fun and can’t obtain alcohol or anything like that to abuse. Many teenagers have taken entire packs of Diphenhydramine for the psychedelic, dissociative experience. However, this is very scary because many studies have been released that highly suggest that chronic Benadryl supplementation could be a direct cause of the development of dementia and Alzheimer’s disease later on in life. That just goes to show that there are risks for the supplementation with new medicines, especially when there isn’t enough long-term research available. Is Fluticasone Propionate the Same as Flonase? Yes, Flonase is just the brand name given to a patented ingredient list that is most popular for an allergy product that uses fluticasone propionate to treat allergy symptoms like sneezing, nasal congestion, runny nose, sinus headaches, and more. Actually, how I would rephrase that more appropriately is that Fluticasone is not Flonase, but Flonase is made of Fluticasone Propionate. Flonase is the brand name and anything else containing Fluticasone Propionate will be a generic brand for the allergy treatment. Is Fluticasone Propionate an OTC Antihistamine? No, Fluticasone is not an antihistamine because it is a steroid. More specifically, it is a corticosteroid that works by forcibly reducing inflammation in your sinuses that causes the symptoms of allergies like sinus congestion, nasal drip, sneezing, and headaches. Antihistamines like Levocetirizine and Fexofenadine OTC work by internally eliminating the chemical histamine in your bloodstream, which promotes the inflammation that causes allergy symptoms. Corticosteroid nasal sprays for allergies don’t affect your bloodstream or the systems of your body directly. Is Fluticasone Propionate Allergy Spray Available in the United States? Yes, Flonase is now OTC in the United States and you can purchase it over the internet. In most parts of the world, it is available for purchase without a prescription as well. Is this Nasal Spray a Decongestant? Technically, it is not really a decongestant. It is not really an effective treatment for those that suffer from severe congestion, however, it can definitely relieve congestion. Its mode of action simply relieves inflammation in the sinuses, which ultimately opens up the sinuses and provides soothing relief from irritation. This may help excess mucus drain through your sinuses and break it all up physically. However, if congestion is your biggest issue, I would not rely on Fluticasone Propionate to help relieve it. I have written about effective natural nasal congestion relief here. The use of this allergy nasal spray is not recommended unless you have severe allergy symptoms during your pregnancy that are affecting your general health. There have been a few animal studies that suggest that corticosteroids may have a teratogenic effect on a woman’s body, just like alcohol would. Inhalation of these sprays could result in decreased fetal body weight, so it is advised that you avoid Flonase and most other allergy medicines while you are pregnant, nursing and breastfeeding. It seems that an uncommon side effect of inhaled corticosteroids is a fungal infection in the throat, which is essentially thrush that you can physically observe. If you have correlated use of Fluticasone Propionate with thrush or a fungal/yeast infection, then that may be the case. I would suggest that you ask your doctor about switching your allergy treatment to something else. Can Fluticasone Raise Blood Pressure? Nasal sprays for allergies of all types typically do not affect your blood pressure significantly. Flonase is a corticosteroid, which causes physical changes in your sinuses and may affect heart rate for a very short period. However, it should not cause such a problem that it results in you asking this question. Therefore, your high blood pressure may be caused by something else other than Fluticasone Propionate. Can it Raise Blood Sugar? If you have diabetes, Flonase and other allergy nasal sprays should be fine for you to use. It does not seem to have a major effect on insulin or blood sugar levels. A common problem is steroid-induced diabetes, which may be caused by something stronger than a nasal corticosteroid like this. I wrote a bit about high blood pressure natural treatments here. No, Flonase allergy spray will not make you high. No, it is not a stimulant. It does not seem to be a problem for people taking generic Flonase to develop an addiction or physical dependency. However, it can still be a possibility just like any other substance you can consume in your body. If you found yourself dependent on daily consumption of this nasal spray for allergies, please check out my popular post about natural allergy medicine withdrawal treatment and addiction symptoms. Will Fluticasone Keep Me Awake? This should not be a problem for you because it is not anything more than mildly stimulating in your sinuses. It is a steroid, but it doesn’t affect heart rate or the neurotransmitters in the brain. If you have insomnia, perhaps something else in your lifestyle is causing this issue. What is the Dosage for this Allergy Medicine? The recommended dosage for generic Flonase is 50-100 micrograms per day. That equates to about one or two sprays in each nostril. Does Flonase OTC Make You Tired? No, Fluticasone and Flonase in nasal spray form do not make you tired. If you have a question or something to add to my Flonase OTC review, then please leave me a comment below!